October 1st, 2008 The Hunger Games sent out a spark into the world of YA literature. And starting September 1st, 2009, that spark is now Catching Fire and spreading! Eh? I thought that was pretty clever! THIS BOOK ROCKS!!! Honestly. Hunger Games fans will not be disappointed. We are reunited with all our favorite characters-- Katniss, Peeta, Gale, Prim-- and even some of our favorite hunger games contestents are remembered in this book, though they do not appear themselves. And I will warn you now, that we DO get to experience The Hunger Games again. So once more 24 people will enter the area and fight to the death. Allthough it lacks the strength of the first Hunger Game, it's still extremely intense. The Hunger Games was just so unbelieveably strong that even this book pales in comparision. 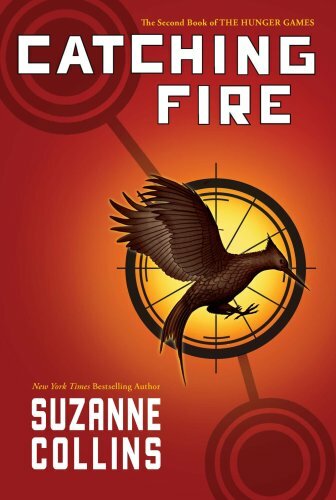 All in all, Catching Fire has romance, violence, and a gripping story. I didn't put it down for over 6 hours! I loved it! I'd definitely say that I enjoyed The Hunger Games more, but I liked this maybe one teeny, tiny percent less. Definitely a Squeaky Book. awesome. I can't wait. so, how did you get this? wait...how were you able to get this? i thought it wasnt coming out till september? Anya & Alysa-- It doesn't come out until September 1st, but I have connections and was able to get my hands on an ARC. I was so pleased! I'm so excited for this one! Thanks for the review! I am so, so jealous of you. I want this book so badly! I don't think I can wait until September!!! I totally agree with you! I read the book in one sitting, I found myself gasping at certain parts especially when I found out they were going to be in the hunger games again. I can't wait for the third book to come out! I love your blog! I actually just started my own book review blog and I would love if you could check it out or give me any suggestions, thanks!